Once again and seemingly out of nowhere, at least for me, the holidays are upon us. For many, this means Christmas, which falls on a Wednesday this year. Hanukkah, the Festival of Lights, begins on Nov. 28, coinciding with Thanksgiving for the first time since 1888. According to Jonathan Mizrahi, a Jewish-American quantum physicist, the next time one of the nights of Hanukkah will coincide with Thanksgiving will be 2070, and the first night of Hanukkah will not fall on Thanksgiving for an estimated 77,798 years. Kwanzaa starts Dec. 26, celebrating such themes as faith, purpose and unity. Though many would argue that “bah, humbug” is much more reflective of their feelings at this time of year. "I think a lot of people would say that the holidays are the worst time of the year," said Ken Duckworth, MD, medical director of the National Alliance on Mental Illness in an interview with WebMD. "Many feel miserable, and that's not only for people with clinical depression." The “holiday blues” can stem from a variety of sources, such as current events, personal grief, loneliness, illnesses of all kinds, economic concerns, separation from family members and relationship issues like separation or divorce. These feelings can easily be exacerbated by stressors, many of which are experienced in this season alone. Many of us wish—or feel obligated to—host holiday parties, whilst being cajoled into attending those of family, friends and acquaintances. Decorations are beautiful, but someone has to put them up. Not to be forgotten are visits with family members who are only seen once or twice a year and fighting the crowds to find that perfect gift. All of which is compressed into a four to six week block of time. Being surrounded by family and friends, and watching the interaction between others, has a strange way of highlighting what’s changed in a person’s life, or what hasn’t changed. The complex swirl of emotions that is the “holiday blues” is a vicious cycle: I feel down, but it’s the holidays—I should be happy. I’m not, though, and that makes me feel even more miserable. I’m stressed, which is limiting my enjoyment of the season, and I feel miserable because I don’t want to be stressed. I wish things were the way they were before. I wish my life was more like his or hers. “These feelings don’t mean that the solution is to skip the holidays entirely,” said Duckworth. Instead, there are strategies one can follow to minimize the negative aspects of the season. Don’t worry about how things should be. “There’s a lot of cultural pressure during the holidays,” said Duckworth. “We tend to compare ourselves with these idealized notions of perfect families and perfect holidays.” But remember, those other families doubtlessly have their own stressors and ruminations to contend with. Be realistic. You can’t please everyone the rest of the year, so why try to during the holidays? Saying ‘no,’ whether to gatherings or a present on someone’s wish list that you simply cannot find, can be one of the most challenging parts of the season. But your own mental and physical well-being needs to come first. Don’t try to be a superhero (or heroine). We all have complex family dynamics. Acknowledge them, but also acknowledge that, despite the season’s near-universal message of unity and peace, it’s not a realistic outlook. If you must spend time with these people, try to limit your exposure. Volunteer. Volunteering can be a great source of comfort, simply knowing that you're making a small dent in the lives of people who are not as fortunate. This is a great strategy if you feel lonely or isolated. Consider seeking out other community, religious or other social events. Keep your own well-being in mind. Yes, the holidays are technically the season of giving. But that doesn’t mean you should take yourself completely out of the equation—instead, add yourself to it. Give yourself some time away from the hype, even if it’s just for half an hour a day. Exercise can also help, with its known anti-anxiety, anti-depression effect. Even a small amount of exercise, such as parking further from the store, can do much to improve your state of mind. Give it some thought. Do you really have to do everything on your list? “Ask yourself, ‘Why am I doing things that make me miserable?’” Duckworth said. “Think about the reasons.” He suggests that you draw up a list of reasons why you engage in these holiday traditions, and then a list of reasons why you shouldn’t. Just making a simple pro and con list will remind you that you do have a choice. 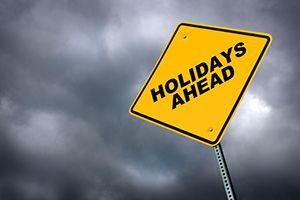 Make sure that the “holiday blues” haven’t become a scapegoat. You could be experiencing Recurrent Depression with Seasonal Pattern (previously known as Seasonal Affective Disorder) or another biological or psychological cause. If these are persistent feelings, make an appointment to see your doctor. If anyone is having the blues, I understand, and I genuinely love you!